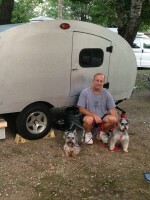 Teardrops n Tiny Travel Trailers • View topic - Where is all this aluminum at. Where is all this aluminum at. I'm planning my trailer and am having trouble locating aluminum for the roof. The pieces at Home Depot are too small. I was also wondering about the glue for attaching it. Any advice will be appeciated. Finally I'm more of a wood guy so my sides are going to be made of oak. What kind of finish last the best? I've used varathane on outdoor funiture, with some success but was wondering about epoxy finishes. Again any advise. How wide is your trailer? You will have to go to a metal supplier for most sheets. Mine has 4X10 sheets in stock. For a 5ft wide trailer I found some at a place that makes/fixes semi trailers. They have sheets that are 101" and as long as you need. Re: Where is all this aluminum at. Billy Schutte wrote: I'm planning my trailer and am having trouble locating aluminum for the roof. The pieces at Home Depot are too small. I was also wondering about the glue for attaching it. Any advice will be appeciated. Welcome to the wonderful world of building tear drops. We have found lots of places in the country to buy aluminum, so if we knew your latitude and longitude we might be able to help you in your search. Many people use no glue on the aluminum, they are the ones that "float" it. attached only at the edges and doors etc. Others use silicone, some use Henerys products while some other use carpet adhesive. As far as side finishes there are as many answers to that question as there was to the aluminum gluing..
Billy - look up at the top of the page where you signed in, see "Rich's list"? Lots of info you are looking for. "Geocacheing" did you mean Geocaching? Sound like fun, what kind of treasure do you hunt for? Have you checked out SAF? They have free shipping too! P.S. Does that mean this is a hijacking? Thanks for the tips I'm looking forward to this project. If I don't drive my wife crazy before I'm done I'll consider it time well spent . I do geocache, out of Laramie Wyoming. My handle there is The Schuttes. My plan is for a Benroy with wood sides and an aluminum top. I've already got the trailer and the material for the floor. Thats it for March as I am spreading the cost out for a few months. Hopefully we can use it on vacation in August. I've started the picture collecting, and I've started a spreadsheet to keep track of every penny, I thought it would be a good thing to post when I'm done. I'll post some pictures when I'm home, this is not my computer. If you wanted to know anything more I'm a 40 year old Firefighter with two teenage daughters and a 16 year marriage. Whats the standard gauge sheet aluminum everyone uses? If you go to this web site and click on the truck camper on the right side and go through his pictures you will see the rolls of aluminum that was used. It looks like the stuff I saw.